Malaysian general election just went by and I am damn glad that I didn't vote. Don't give me that: "you're not practicing your rights speech". %#%$@!! For all I care they are all a bunch of clowns. Why am I so furious? Well I've just recently serviced my car; it's a normal major service for 60,000 KM. They done everything to the book inclusive of alignment & balancing, the bill totaled to RM5XX. It's okay for me since it a major service. However, yesterday as I was on my way back home; I hit a big pot hole in the middle of the MRR2. What the ^%$#@!! It was unavoidable; people couldn't see it as it was raining and the damn thing is filled with water. People pay road tax, income tax, service tax.. the lot to a lousy administrator $#@%$#!! Today I discovered that when I corner, my right front tyre would hit the bodywork. %$@$#!! First ripping me off with taxes and now I have to pay more for the repairs and take time off to send the car. To me, this is not bad luck; just plain statistics. That hole for all I know has been there for weeks, and I'm one of the people so happen to dunk a tyre in it. If you're the D*** F*** that maintains the road, please do your F****** job or go rot in hell for all I care. Do you want to pay for the damages incurred? Don't wait till a motorcyclist tumble and die to take action. Drivers & motorcyclist; please be careful if you are using the MRR2 and heading towards Gombak. 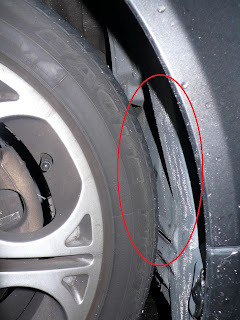 The pot hole is just before the Kampung Pasir flyover on the right most lane. Note to other readers: I don't usually post these kind of entries, but I'm really pissed. dah ada la cyclist pillion rider mati in rawang, because of pot hole. and i'm sure that was not the only one. that's why i didn't even bother to EVEN register, let alone to go and vote. i'm a proud apathetic. as i told everyone (including my parents who actually vote)..
"what we have right now is SH*T, and the oppositions are even SH*TTIER "
how could i use my right to vote when there are no candidates that I favor? other people want oil fuel reduce kan? i don't care a sh*t about fuel price. all i want (this also i tell everybody).. just freaking fix the bloody traffic jam and pot holes. then i'll go out and vote. kalau minyak murah pun tak guna kalau stuck dalam jam. if you can go to work in 20 minutes, but spending 40 extra minutes in the traffic (and burning more fuel).. imagine what you can spend and where you can go with fuel burnt in that extra 40 minutes. i might get criticized for this, but truthfully, i'm not proud to be malaysian. really. My cousin fell from his big bike many years back from the same spot where a fellow motorcyclist fell and died a week earlier. It was in the papers. It's not in our culture to improve; build.. let it rot and then build a new one to replace. PWTC, the roller coasters at Sunway (now dismantled), Bird Park, Zoo and are neglected from proper maintenance.